The Colombian drug business is booming. Bricks of cocaine are making their way regularly out of the country, smuggled aboard airplanes headed all over the world. Through the use of ruthless intimidation, cunning planning, and managing to stay hidden from his enemies, most of this industry is run by a single man known as El Patrón. From his many different safehouses and strongholds, he operates beyond the law. But the law isn’t going to simply sit idly by and let him continue his illegal trade. And in his rise to power, Patrón certainly has created a long list of enemies. The hunt is on, as a multi-national group is closing in around Patrón and his works. But will he be able to slip through the net again, as he so often does? And what about the people of Colombia? Many of them worship Patrón as a hero and would gladly elect him El Presidente. Will the authorities capture him this time, or will Patrón slip through their fingers again to rule another day? Narcos: The Board Game is a hidden movement and resource management game where one player takes on the role of El Patrón, leader of the Colombian drug industry, trying to stealthily make their way around the country, sending out their Sicarios to do their dirty work, while the rest of the players form a coalition of Factions looking to hunt him down. The Factions have to work together, triangulating and coordinating their movements, sharing vital information, and attempting to capture Patrón twice before he gains too much popularity and achieves victory by completing objectives or becoming El Presidente. The game board features a map of Colombia. Across the map is a network of locations, from the various cities in the country, to all the outlying farming settlements. Patrón could potentially be hidden in any location, and it’s up to the Factions players to figure out just where he is. This is done over a series of rounds, called Seasons. During a Season, the players will alternate turns, starting with Patrón, then one of the Factions, then back to Patrón again, then another of the Factions. That continues until all four Factions players have had a turn. Once a Faction player has taken a turn, they are done for that Season, but they can still help the other players by discussing the potential hiding places for Patrón. On a turn, Patrón will deploy one of their Sicarios. There are many different henchmen that work for Patrón, but only a small number will work for him each game. Two that are always around are León and La Quica, Patrón’s most trusted employees. When Patrón starts a turn, they will choose one Sicario to place on the board. Each one has a different special ability when placed, from smuggling drugs, to growing new crops, to assassinating enemies. When placed, there are limitations on where they can go. They can only be placed so many spaces away from Patrón’s current hiding spot. This gives the Factions players a small clue as to where Patrón currently is. Necessity can create strange bedfellows, and that’s just what we have with the Factions. While it might be not surprising to see the American DEA working with the Policia Nacional De Colombia, the addition of the Cali Cartel and Los Pepes goes to show how desperate all these groups are to shut down Patrón’s operations. Each Faction has two Hunters that they will move around the map and perform actions with during their turn. These include trying to capture Patrón’s Sicarios, set up roadblocks to halt Patrón’s movements, and gain clues as to Patrón’s hiding spot. Each Faction also has its own special ability, such as the DEA’s ability to increase the value of certain actions or move their Hunters around Colombia faster, or Los Pepes’ ability to gain money any time Patrón does, using their own drug networks to increase their wealth, which can then be spent hunting Patrón down. El Patrón’s location on the map is always hidden, being marked on a special tab sheet. Patrón must make sure to always keep their location secret. When the Hunters close in, he’s in danger of being captured. Thankfully, he’s a sneaky snake and can be captured once and still continue on. However, if the Factions players close in and capture Patrón twice, the game ends with their victory. Meanwhile, Patrón is constantly gaining Glory in Colombia. Once he gains enough, he’ll be elected Presidente and win. Narcos: The Board Game is a game of wits, deduction, cunning, and stealth. Will the Factions be able to close the net around the elusive Patrón? Or will he once more slip away into the jungle underbrush, only to gain power with every passing Season? Narcos: The Board Game will be available in your FLGS on November 23. 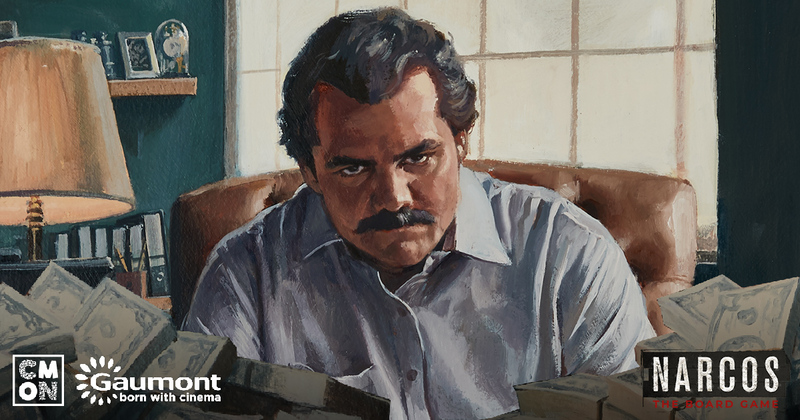 Learn more about Narcos: The Board Game here.